Art Advocado: Art Education Advocacy Blog: Public Art: The Advocate’s Secret Weapon? 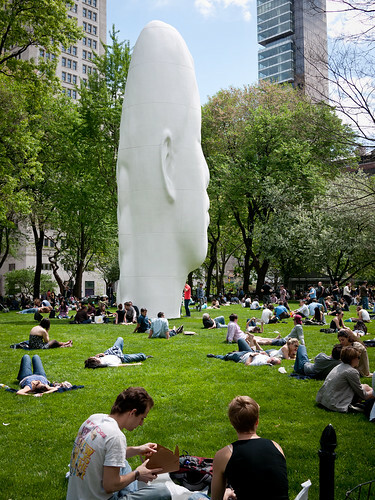 Jaume Plensa, Echo, Madison Square Park, NYC. CC Image courtesy of ekonon on Flickr. Happy summertime! Here in my fair city (and perhaps in yours), the start of summer means an explosion of outdoor art events—some of which take the form of public art. Aside from providing an oasis for the eyes in the midst of this (sometimes not-so-fair) city, public art has other benefits that contribute to the well-being of NYC. In celebration of our newfound ability to enjoy the outdoors after a brutal winter (hooray! ), I will be writing a series of posts on public art over the course of the summer. For my first post I’ll give a bit of background on what public art is and why it’s important for arts advocates to pay attention and be well-versed in this topic. Read on to find out why public art is our secret weapon! In the past, public art was considered the sole jurisdiction of historical monuments, like this sculpture of Abraham Lincoln in Union Square here in NYC, or the Civil War generals and other Richmond heroes that populate Monument Avenue in Richmond, VA. Of course, historical monuments are still a big part of public art today. The Statue of Liberty is one of NYC’s most enduringly popular tourist attractions and she is certainly a work of art in the public sphere. On the flip side, I have seen dozens of people, tourists and residents alike, scoping out the Andy Monument outside the former location of Mr. Warhol’s Factory, just north of Union Square. (Fun fact: Andy’s Factory is now a Petco.) And Saint Louis is slated to erect a statue commemorating early rock’n’roller and native son Chuck Berry in their city. However, today public art is much, much more than figurative sculpture memorializing historically significant ladies and gentlemen. In NYC, organizations such as Creative Time and the Public Art Fund have been curating and producing innovative and exciting public art projects for years. Public Art Fund is responsible for the aforementioned Andy Monument, as well as the Sol Lewitt exhibition taking place in City Hall Park this summer. Creative Time works to redefine public art with inventive and awesome projects that are frequently performance based. Last year’s Key to the City by Paul Ramirez Jonas is a great example; for the project, Jonas created and distributed keys to dozens of secret or often hidden spaces in New York City. The holder of they key could discover the space on their own and then pass the key on to another, creating an informal social network an encouraging civic pride in residents and tourists of the city. Creative Time also produces the hugely popular and very moving Tribute in Light each year on the anniversary of the 9/11 attacks. 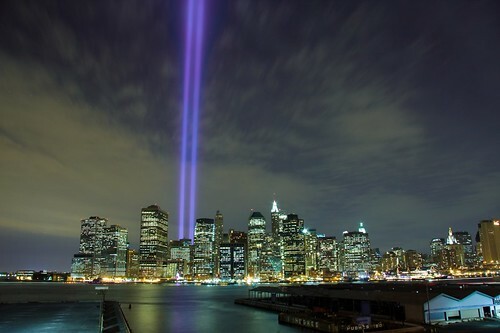 Tribute in Light, 2009. CC image courtesy of digitized chaos on Flickr. Above I outlined some different varieties of public art. That’s all fine and nifty, but what does public art DO, other than provide a free, aesthetically pleasing and thought provoking activity? In the past I have talked about the intrinsic versus instrumental values of art, and how sometimes it’s not easy for advocates to reconcile the two. Well, good news—public art does both! That’s why public art can be an arts advocate’s secret weapon—a great item to keep in your back pocket if you are speaking to legislators—or even members of the community who are skeptical about arts funding—about the positive impact of the arts. Well said, Mr. Mayor—that could even be an arts advocacy pitch! Bloomberg clearly understands both the aesthetic and instrumental effects public art can exert on the city—and how powerful the two are when combined. Indeed, Bloomberg also showed his support by participating in the aforementioned Key to the City project last summer. And in the same LA Times article public art administrators praise Bloomberg as a great friend to their cause through the duration of his mayorship. Going beyond NYC, this article from The Dirt recaps a speech on public art by Gary Steuer, Philadelphia’s chief cultural officer. In his speech Steuer and his colleagues outlined how public art has exerted positive aesthetic value AND instrumental effects on communities across the country, from North Adams, MA to New Orleans. All three of these stories are great advocacy anecdotes, as these examples of public art have accomplished a TON for their respective cities. Are there examples of public art in your area—whether old fashioned or cutting edge? Have you seen positive effects on your community as a result, whether aesthetic or otherwise? I’m afraid my perspective is a little NYC centric, so I would love to hear about public art around the country and abroad!